This is a view of the Donghai Bridge from the mainland. 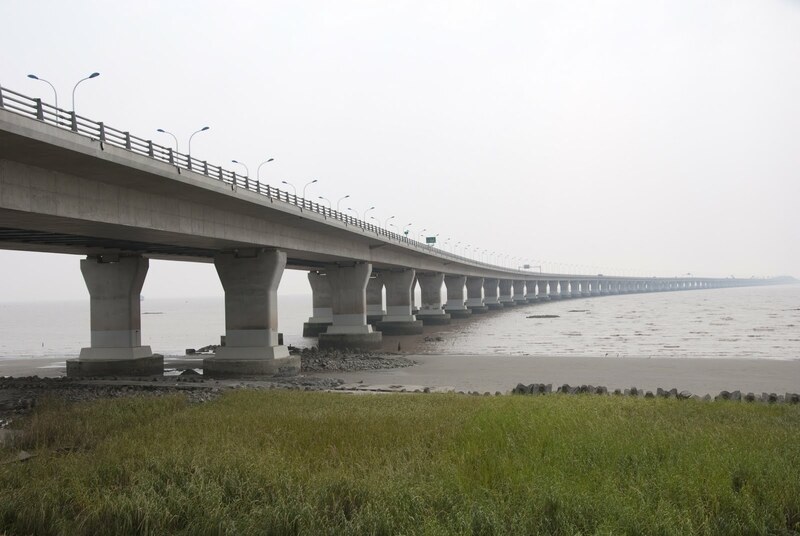 The bridge extends about 29 km southeast into Hangzhou Bay. The water is 10 to 15 m deep over 130 m of loose, clay deposits. After the large diameter concrete piles were placed, a squat reinforced concrete column was cast on top of each pile. Steel/concrete composite box girder segments were built onshore, lifted onto the columns, and made continuous. The superstructure is 31.5 m wide and the spans are 50 to 70 m in length. The columns have shear keys to prevent the superstructure from moving transversely. The superstructure must slide back and forth on the columns longitudinally due to changes in temperature. Although the bridge was reportedly designed for strong wind, waves, earthquakes, etc, it appears to be quite vulnerable to my eyes. Any large vessel could easily knock over the columns, which have no fenders and aren't even provided with a cap beam to add increased strength. Still, the bridge has survived several years without incident so perhaps I am being overly cautious. The cost of the bridge was just under $1 billion. Shanghai's Bridges: Donghai Bridge (2) by Mark Yashinsky is licensed under a Creative Commons Attribution-NonCommercial-ShareAlike 3.0 United States License.